When best friends Abbie Cornish and Jacqueline King Schiller started cooking together, they weren't thinking about sharing their recipes with the world. After friends began asking them for tips on how to cook more nutritious foods, however, they got the idea of putting together a cookbook. More than two years later, we can thank Cornish and Schiller for Pescan (Abrams, March 26), a book that fits the diets of many modern-day cooks. Their recipes rely mostly on plants and are completely dairy free. They do, however, incorporate seafood for a delicious protein boost. The authors' general philosophy for good eating for good health is to load up on plenty of fruits and vegetables (in a rainbow of colors), to avoid processed foods, to use seasonally fresh ingredients, and to eat fish a couple of times a week. They use eggs and gluten sparingly (and these ingredients are always optional in the cookbook). Although both authors found better overall health and weight loss when they switched to a Pescan way of eating, they do not think of their food choices as a "diet." The foods they talk about in their cookbook are simply part of their way of living. If you're looking for recipes that will help you eat a more plant-based diet and meet your own health goals, then Pescan is a good choice. Besides the recipes, Cornish and Schiller offer some great tips for helping you relax in the kitchen. 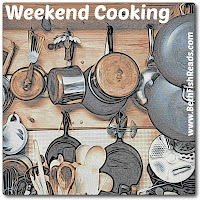 They outline a weekly game plan and provide a number of "starter recipes" that are easy to master and will give you confidence. I like the variety of the simple grain and bean dishes, and the recipe I'm sharing today is my new favorite way to eat carrots. I picked up a few fresh smoothie combos and risotto ideas, and the salads (like a bean and shrimp salad) look really flavorful. 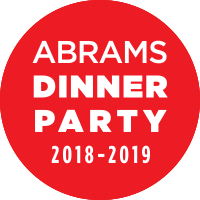 If you're into tofu, you'll want to try the Spicy Buffalo Tofu Fingers with Avocado Ranch Dressing; one of the other Abrams Dinner Party members made it and said it was really good. Someone else made the Watermelon Radish and Smoked Salmon Canapes, which were also a hit. I liked the Fiesta Veggie Rice and the Breakfast Cookies (made with bananas, oats, and dates and no flour; see my photo), among other dishes. I have to mention all the extras you'll find in Pescan. 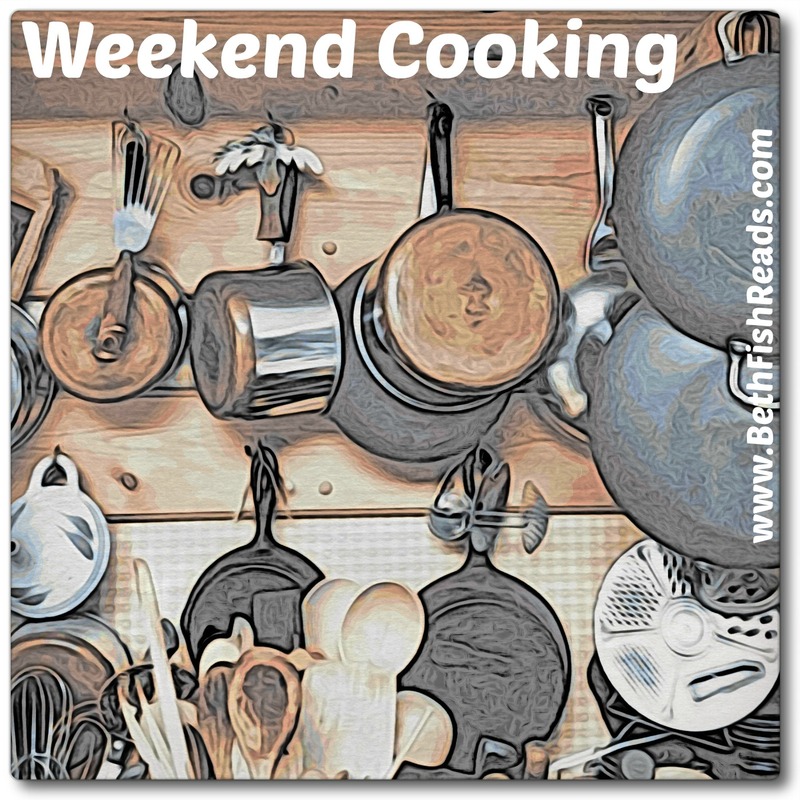 Each recipe starts with an estimated prep time and cook time and ends with information about that dish's "feel good ingredient." For example, the recipe I share below ends with info about carrots and why they're good for us. When appropriate, Cornish and Schiller also provide notes and variations. Don't miss the menus at the back of the book and as well as the equipment suggestions. Beautiful photographs and stories from the authors round out the book. 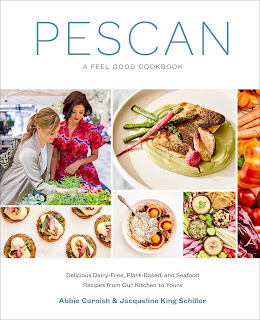 Recommendation: If you love vegetables, fruit, and fish, you'll find a lot to like in Abbie Cornish and Jacqueline King Schiller's Pescan. If you're fairly new to dairy-free, plant-based cooking, go ahead and buy a copy of this cookbook, which will guide you through your transition. If you're an experienced cook, you may want to check it out from the library first, just to see if it's a good match for you. I'm pretty impressed with the flavor combos (Roasted Brussels Sprouts, Dried Cherries, and Walnuts? Yes, please) and how easy the recipes are to make. Note: I received this book as part of my participation in the Abrams Dinner Party. My thoughts are unbiased. 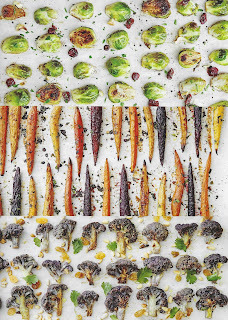 If you haven't jumped on the roasted veggie bandwagon, then you're missing out. I rarely steam or saute fresh vegetables anymore because we prefer roasted or grilled. 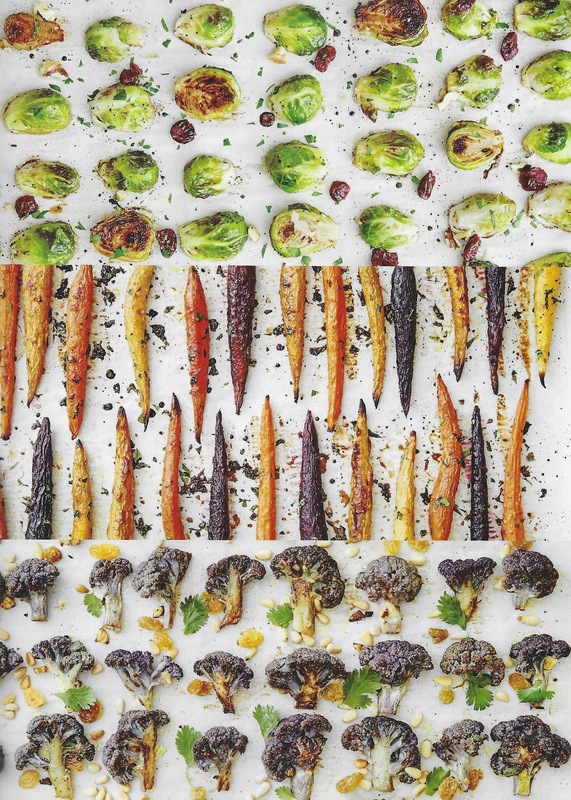 The photo accompanying the carrot recipe is from Pescan and shows roasted Brussels sprouts and roasted purple cauliflower with the rainbow carrots in the middle. Note that there's no reason not to just use all orange carrots. Preheat the oven to 425F (220C) and line a baking sheet with parchment paper. Trim the carrot tops (if necessary) to 3/4 inch (2 cm). Rinse and scrub the carrots well with a paper towel for a rustic look or peel them if you want a very smooth look. Place the carrots on the baking sheet. In a small bowl. grate the ginger, then add the oil, maple syrup, water, salt, black pepper, cayenne, and cumin. Whisk with a fork. Pour the mixture over the carrots and turn them a couple of times to ensure they are well coated. Arrange the carrots in a single layer and make sure there is a little space between each one to allow air to circulate. Roast the carrots in the oven for 20 minutes. Remove and carefully turn them using tongs. Pour the orange juice over them and sprinkle with the cilantro leaves. Roast for 10 to 15 minutes more, until they are soft and wrinkly on the outside and tender-crisp in the middle. 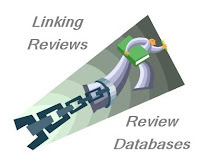 Many of the cookbooks you review seem to have very similar goals and methods, reflecting current trends in what people want to eat and the overall current views of what is healthful and pleasing. It's hard to see which ones you would really recommend the most enthusiastically. Or maybe they are all pretty good? This is one I will seek out. We try and keep it as natural as possible and now, my husband is eliminating gluten from the meals again. It’s not a fad thing, he needs to get off Prilosec for the acid reflux and once gluten is out of his system for 14 days, he can quit Prilosec without getting the reflux. So I will be looking for this book, sounds perfect. This is pretty much like how I want/like to eat. Gluten free is easy as we do that for John. I "cheat" sometimes on my own. Fish, I could eat every single day but John is just trying to enjoy it often. I do enjoy all kinds of meat and poultry though. As for veggies we have really upped our game. Just want to mention how much I enjoy Weekend Cooking- thanks for hosting it..
My family is full of carnivores so this isn’t the cookbook for me, but it looks like it satisfied you. That carrot recipe sounds so good! I totally need this cookbook. I'm off to order it right now! Thanks so much for featuring it. Abbie Cornish is an Aussie, but it sounds like she's living in the US now from what you wrote. Pescan looks divine! Perfect for the way I eat -- or, try to. Thanks for the recommendation! I may try these carrots for Easter.